Yellowstone is the grand dame of national parks, being the first one and containing the world’s largest collection of geysers. It was established as a national park in 1872 in the northwestern corner of Wyoming (with a bit of Montana and Idaho thrown in to boot). There are around 3500 square miles in the park, served by a loop road at least one hundred miles long. From Mammoth Springs at the North end around to the sometimes frightening drop offs and vistas on the east side by Tower and Roosevelt to Lake Yellowstone, West Thumb, Old Faithful, Norris and on, there are a multitude of dazzling scenes, tons of wildlife and many things to do. We are just back from a road trip from the mid west to Yellowstone National Park and back. It was the trip of a lifetime with our extended family (two sons, their spouses and two of our grandchildren). Each family charted their own way out, in their own vehicles but we stayed together loosely in the park. We paid for three nights lodging in the Old Faithful area for all three families so we would have an initial base together. Each day we hiked together or went out on our own and then got together in the evenings to share our adventures with each other. After the first three days, two families stayed at Lake Yellowstone and one went on to Canyon – but we still got together each day. We had two family dinners, one at Old Faithful Inn and one at Lake Yellowstone. In addition, we did the Western cookout – with a covered horse drawn wagon ride from Roosevelt stables out to the cookout; and we took an historic Yellow Bus tour at sunset to the Lake Butte overlook. It isn’t cheap to visit a national park, if you stay in the park lodging and eat at restaurants – which we did (because I am NOT a camper! ), but there are some things you can do to trim expenses. Gas up before entering the park. Gas was at least 40 cents a gallon higher in the park than outside the boundaries. If you drive, you will most likely have to buy some gas in the park, but it is a safe bet that getting it elsewhere will be cheaper! Stock up on edibles for picnics and snacks before entering the park. Take a cooler and fill with ice, sandwich meat and other goodies so that you can avoid eating all your meals in the expensive park facilities. We paid $3 a bag for 10 lbs of ice in the park. Turkey sandwich meat was $5 a pack. The constant average price for a breakfast or lunch at any of the facilities we visited was around $8 a person (for burgers and fries). Take your own coffee pot, coffee, filters and your own soft drinks and water. Coffee was generally $2.25 a cup for a 12 oz. size drink. We took a little 4 cup electric coffee maker and used it since we are big coffee drinkers. We also stocked up at the Cody, WY Walmart on things like soda, chips, bread and etc. Since we have now reached the laudable (??) status of senior citizen, we are eligible for a senior park pass. These cost $10 and are for your lifetime. I bought one, but my spouse did not. The one pass let us into all the national parks and monuments we visited free of charge. 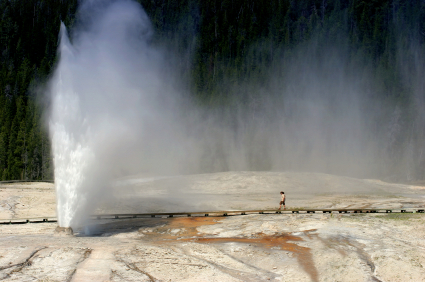 It costs $25 just for Yellowstone (so it paid for itself right away). We also visited Devil’s Tower, the Badlands, Scotts Bluff National Monument, and the Battle of the Little Bighorn Monument, so we saved quite a few bucks just on this trip by getting a pass. Even if you are not senior, you can get a one year pass – worth it if you plan to visit many parks in a year. Stay in the cheaper rooms. By accident, we managed to reserve the shared bath rooms in the old part of the Old Faithful Inn. These rooms are close to the sensational lobby and have a sink in them but no toilet or shower. You walk down the hall to the new part of the Inn and use a bathroom with multiple toilet stalls and several shower stalls – all private and available when you need them. These rooms were actually more fun than the rooms in the newer section with private baths – and they were cheaper. If you reserve early enough, ask for room 229, the room the architect, Robert Reamer, used. It has a view of Old Faithful! Stay in the cheaper areas. Because we wanted to do the Roosevelt Western Cookout and didn’t want to have to drive back to Lake Yellowstone, I reserved a cabin at Roosevelt. I was early enough in reserving to get one with a bath and an electric heater (needed even in summer time). Most of these cabins have a wood stove and you have to use a shared bath (which you have to walk outdoors to get to). These cabins get booked fast, so reserve in early May for the next year if you want to stay in them. Explore the area in which you are staying. Instead of driving round and round the loop road, stay in one area and walk or bike the paths to really enjoy the park and avoid using a lot of gas. Plan your trip so that you stay close to several areas – in a different lodge for each area. We stayed three days in the Old Faithful area, two days in the Lake area and one day in the Roosevelt area. We had already seen the Mammoth and West entrance area on our last trip. You will save gas money and frustration. The figure 8 loop road gets crowded in the summer time so putting more folks in each car makes sense. We pooled with our youngest and his wife an entire day. It was great letting him do the driving while we gawked. Wait until later to do laundry. Either take enough clothes to last your trip in the park or hand wash and air dry what you need day by day. It is expensive and time consuming to do your laundry in the park. If you enjoy a glass of wine in the evening or a beer in the afternoon, consider stocking your cooler instead of buying at the bar. Of course, don’t drive afterward. Campsites range in price from $20 – $45 depending on which campground and how big the site is. Of course, you need the RV, camper or tent because you don’t want to sleep unprotected against the bears and other wildlife! Gardiner, Montana is a cute little town just 5 miles from the North entrance to the park (which is right at Mammoth Hot Springs). There are multiple lodging choices at multiple price points – and competition (which is sorely lacking in the park because the government has contracted with one company to run all lodges in all parks!). Jackson Hole, WY is a high end tourist town at the south end of the park. It is about an hours drive (barring traffic and road construction) from the south entrance to the park. You can get to Old Faithful, West Thumb, Grant Village and other attractions relatively quickly (I say relatively because traffic in the park is s-l-o-w). Cody and West Yellowstone are the other border towns, but they are further from most of the attractions. Don’t eat at the restaurants. Take a camp stove and plan your visit to include special picnic areas. You can use camp stoves, self contained charcoal grills or the fire pits provided in the park to cook your meals. Many of these areas are in wonderfully scenic areas with high probability of seeing wildlife and most have at least one bathroom facility. Visit the lodges by day. Old Faithful Inn and Lake Yellowstone Hotel are both wonderfully historic structures and both offer free guided tours. We brought a bottle of wine and a picnic supper and shared it on the deck facing the Old Faithful Geyser at Old Faithful Inn (on the second level)….WOW. We also sat and chatted with our son and daughter-in-law in front of the fireplace at the Lake Lodge building, enjoyed the free piano concert and string quartet in the sunroom at Lake Yellowstone Hotel and rocked in the rustic rockers on the porch of the Roosevelt Lodge. Can you tell I like the historic park lodges? Utilize the Park Ranger activities. Free walking tours of the geysers, night tours, junior ranger activities for the kids and more are available for summer visitors. The full schedule is available on the National Park Service Yellowstone website. We had a wonderful family visit to Yellowstone National Park. Although it wasn’t cheap, we did manage to save a bit of money – which we then spent on great souvenirs! I hope you get to visit this fabulous park – in my opinion, in should be on everyone’s bucket list! Have you been? How did you save money? I have been – I was lucky and went when I was a kid, before they had that big fire years ago. This is a great list – it makes the point that anywhere there’s a captive audience, prices go up! Sounds like you had a great time! Lack of competition is bad for consumers. As I think I pointed out, you could camp or stay at one of the gateway cities (which are also expensive but at least there are a lot of choices – and TV!). This post came at the perfect time! We have been really wanting to go (we’ve never been). These are all great ways to save! Plan to reserve your lodging a year ahead of time. I’m putting up a post about staying at Old Faithful Inn next Tuesday on my blog – so feel free to visit and check it out! These are great tips. I haven’t been to Yellowstone since I was a kid, but I’d love to go again. Thanks for sharing some frugal ideas! I went as a 4 year old but didn’t remember anything, except from the pictures and stories told for years afterward. My wife was talking about taking a trip to a national park like Yellowstone or Glacier — thanks for the tips! We figured out to not stay in the national park lodges because they’re expensive, but the rest are great ideas! The lodges are expensive, but in my opinion, if you can afford it, they are worth it. They actually become part of the experience, part of the history. Depending on how and when you visit Yellowstone you could end up really missing out. In summer, traffic on the loop road can get excessive. Even in early June when we went, we sat in a traffic jam one day for at least 1/2 hour…people will just stop when they see wild life or maybe the roads are being worked on, or maybe the bison are ambling onto the road (they often do) blocking traffic. It takes awhile to drive the entire loop and you really don’t see much of anything unless you get out and walk – which takes time. Visiting Yellowstone National Park is definitely on my bucket list. These are some very good savings tips for the trip. Naturally, the travel expenses are very high, and it certainly pays to have a money savings plan. I even drew up a trip budget for this one! My parents took me to Yellowstone – on a 23-day, cross-country adventure – when I was 10. It was, as you said, the trip of a lifetime. Your post brought back so many memories, and will be invaluable when my husband and I start planning a similar trip for our own kids in a few years! We had a 5 (well almost 5) year old and a beginner 8 year old on this trip. They both did well, but the 5 year old probably won’t remember anything but the pictures – of which there are literally thousand between the three families. My youngest son had just gotten a camera for his birthday and they alone took 5K pictures! My other son took a couple thousand and I managed to snap about 500. Gotta love digital pics. How old do you want your kids to be when you go? I have been here once, with my grandpa. I was amazed by the geysers, and how they discharge a great amount of water and vapor. We had a campfire and charcoal grills as well. What an experience! Hope my grand kids remember going with me! According to what I remember reading on the park site, you can no longer have charcoal fires…. I think the fire danger most everywhere in the middle of the US was extreme this year. Yikes! Here in Pennsylvania, a street in Reading just burned out. Good thing, no people were harm.